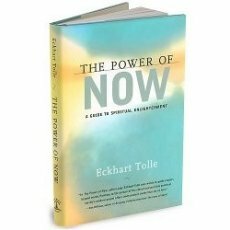 Review for The Power of Now: A Guide to Spiritual Enlightenment, I Find this Book Useless. "I Find this Book Useless." I took a look at this because everyone seems to hype this book. It's in the same section of the bookstore as stuff on "crystal healing" - strike 1. Subtitle of the book contains the words "spiritual enlightenment" - strike 2. I couldn't get through the first chapter. Too much "spiritual" mumbo-jumbo. "You are not your mind" - of course i'm my mind, what else would I be. There's no such thing as a spirit. All that is "me" is electrical impulses in my brain, which is just a very complex computer. As a rational skeptical materialist atheist, I find this book useless.